The following is a bare minimum of what you absolutely will need when you come home with your new puppy. This is a must have item. I highly encourage you to crate train your puppy as this is the safest place for him to stay while you are away. Locking him into a laundry room or bathroom while you are away is only asking for trouble. The crate is designed not only to protect your belongings, but also to keep your puppy from hurting himself or eating something he shouldn't. Remember that your puppy has already been sleeping in a crate and is used to it. My favorite crates are made by the Midwest Company, and I think their 2 door "Lifestages" version is their best crate. I would stay away from their "iCrate" models as they are very flimsy. Their crates all come with a divider which comes in handy, meaning you can use the crate from the first day you bring your puppy home. As far as size goes, I suggest the 42 or 48 inch length size as this will fit nearly all adult Ridgebacks, Male or Female. There are also some really nice crate covers/bed sets out there as well, but wait for these until your pup is an adult. What I typically do is use a smaller, 30" crate to start out (with the divider). It will fit in your bedroom easier for crate training at night and by the time your puppy grows out of it, they will be sleeping in an area outside of your room (if you so choose). You can usually find some good deals on Amazon for these crates. The best collar to use is an adjustable nylon collar, that way you can adjust it, as your puppy grows. After your puppy reaches adulthood then you can get a fancy collar, but when they are pups it's kind of a waste of money. Adjustable Martingale collars are highly recommended as they prevent the puppy and adult dog from backing out or slipping out of their collar. When my dogs are young, I use a generic nylon collar with my phone number embroidered on it. I like leather leads because nylon has a tendency to burn your hands if the dog suddenly pulls. However, some folks like nylon leads. I recommend a 6 foot length. I do not recommend a Flexi-Lead or any type of extendable leash. I feel that these leads give your dog the chance for an accident. If you happen to be looking the other way, and your dog runs out into the road, or is confronted by a small child, it just is not safe. They don't give you enough control. Flexi-Leads are also not allowed at dog shows, or any other AKC events. The Canine Good Citizen test must also be done with a 6 foot lead, as Flexi's are not allowed. For training purposes a 4 foot or 6 foot leash is best. You can find a variety of leather leashes on Amazon as well. Even before you bring your puppy home; make sure you have an ID tag made (or a small size embroidered collar with your phone number). If you still haven't thought of a name for your puppy yet, that's okay. At the very least, put your phone number on there. I have also used the phrase "REWARD" with my phone number to ensure if something does happen, there's a higher chance of me getting my dog/puppy back. Safe toys for your puppy to play with include toys made specifically for dogs. Items such as stuffed toys, Kong toys, and consumable animal parts are good chewable items. I do not recommend large knuckle bones or soup bones as they will break teeth. All toys should be given with supervision. I do not recommend Nylabones, any type of rawhide or any toy that has rope as part of the toy. Pieces of Nylabone can be chewed off causing a blockage or piercing the esophagus and the same goes for rope toys when they are pulled apart. Rawhide actually causes gastric upset, and is made with dangerous chemicals and bleach. Please do not give Greenies, as they have been known to cause choking and gastric blockages resulting in surgery. Safe chews are made of completely digestible material. Acceptable chews are tendons, bully sticks, cow ears, lamb ears, trachea, hooves, antlers, lamb/beef lung, or any other chemical free digestible chew. Remember to give chewable items in moderation. Teething/young puppies are going to chew on everything. I have found that cow ears and lamb ears provide a good outlet for the never ending chewing phase. When your pup is young, the best bedding is in the form of old blankets, towels, and some cheap $3 pillows from Wal-Mart. Your puppy is going to chew, so wait to use the expensive beds, until your puppy is an adult, and out of the chewing stages or you will quickly be replacing it. One type of bed that I have found is indestructible is the Kuranda bed (www.kuranda.com). It is a cot style bed, which is raised up off the floor. It is sturdy enough to be used indoors or out and is easily cleaned with a damp cloth. I have several of these beds and they have lasted through several puppies, and look as good as the day I bought them. I use a fleece pad on top of them as well. I have the heavy duty Aluminum Kuranda beds with 40oz vinyl fabric. They have held up to years of abuse from adults and puppies and still look great. The Kuranda company also sells replacement parts for their beds. I purchase the sizes that fit into a dog crate. There are many types of bowls out there. I urge you to stay away from plastic as it can easily be chewed. For many years I used stainless steel bowls. They lasted awhile but eventually would always rust. If you use them, just be aware and check the bowl regularly. I have since switched to bamboo bowls. They are made with renewable resources and hold up well. They are tough and don't rust. There are also some nice ceramic bowls out there as well, but they can break easier. Either choice will hold up well to your Ridgeback. We also use a large glass bowl in our kitchen for water and keep it filled all the time. I do not recommend a raised feeder as the use of a raised feeder has been linked to bloat for kibble fed dogs. I will send a small amount of food home with your puppy if you are traveling any distance. You should have a supply of what you plan to feed your puppy. If you plan to feed raw, and have never fed your dog raw before, please consult with me so we can discuss. Please ensure you have purchased Ester C in capsule form. Your puppy will need to begin taking ester C as soon as you bring him/her home. 500mg capsules are probably the best as you can easily increase the amount as your puppy grows. If you are feeding raw, this is a must have item. Purchase only high quality salmon oil with no soy or flavorings added. Many folks like to use the plastic storage containers with sealing lids for storing their dogs' kibble. This is a good idea for keeping the food fresh. If you plan to do this, make sure you are storing the food inside the original food bag. When the food is poured directly into the container, it can become rancid in the bottom, then contaminating the next batch of food poured in and making your puppy very sick. Another alternative is to wash out the container between each bag of food. Remember to let it dry out completely before adding the new bag of food. This is not something that everyone will use on a daily basis, but nearly everyone will need them eventually if you take your puppy anywhere outside your home (which you will for socialization/classes, etc). The best ones are the cheapest ones you can find. Some folks use Wal-Mart or grocery bags, just watch out for holes! Please be a responsible pet owner and do not leave your dog's excrement for others to step in. It is illegal, disgusting and punishable by fine. If left an an area where there is water run-off, it can also poison marine life. I'm going to start out this section by saying... I am a toenail nazi. If I see long nails on a puppy or dog, it makes me cringe, because I know what long nails can create. Trimming your puppy's nails right from the start is extremely important for multiple reasons. 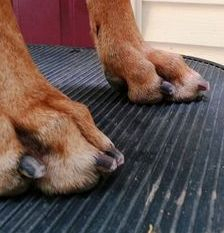 A Ridgeback's nails grow at an exponential rate. I trim my dog's nails at least bi-weekly. They absolutely need it every time. If you don't regularly trim your puppy's nails when he is young it will quickly become an all out battle. When Siege came to live with me at 18 months, he weighed over a hundred pounds and his nails had not been trimmed in a couple of months. The first things that happened when I brought him home were a bath and a nail trim. Little did I know how difficult it would be. He fought me tooth and nail every step of the way, but I absolutely could not let him win. Within a few months of weekly nail trims, he was no longer giving me a hard time. If you let your dog's nails get too long they can interfere with correct development, causing flat feet and downed pasterns. This in turn can cause gait and joint development problems. They will wreak havoc on your wooden floors and leave you and any canine playmates with deep scratches, sometimes breaking the skin. Nails that are not trimmed regularly can also be the cause for injury by way of broken or sprained toes. If you can hear your puppy walking across a solid floor, with clickety-clack... his nails are too long. Your puppy's nails should not extend to the floor. Adult Ridgeback nails are thick and using a regular guillotine trimmer can be painful as it smashes the quick inside the nail. I highly recommend you use a dremel grinding tool with only the sanding bands. Your puppy will be used to the dremel by the time he leaves the litter, because I will be dremeling nails until they go to their new homes. So please continue to trim his nails using a dremel. I will show you how to do this when you pick up your puppy. Watch a few youtube videos on trimming nails with a dremel. Visit THIS SITE as well for detailed instructions. Do some shopping around before you decide on a Veterinarian. Visit as many offices you can in your area, and get their pricing list. Take a notepad with you so you can make some notes when you get back in your car. Also inquire about the nearest Emergency Vet office as well. The office should be clean, and the staff friendly. I would also inquire whether any of the vets are familiar with the breed as well. After you decide on a vet, make your first appointment, so when your puppy comes home, you don't have to think about it. If after your first appointment you do not feel you have made the right decision, move on and find another vet. Always get copies of your puppies current records so he/she can easily be transferred to a new vet. Remember you will be dealing with these people for the next 10-12+ years! Find a good class, by talking to some other folks in your area, or by doing an online search (I can help you with this as well). Plan to enroll your puppy in class as soon as possible (preferably before your bring your puppy home). Your goal for class should be to obtain the puppy's Canine Good Citizen, so look for a facility that offers this. If you have a show pup, look for conformation classes as well. If you plan to do agility or any other performance event, look for a facility that offers this also. Plan to go to class for the first 6-8 weeks you have your puppy home. It is imperative your puppy receives this very important first training. All content within these pages is property of Semper Fidelis Rhodesian Ridgebacks unless otherwise credited. 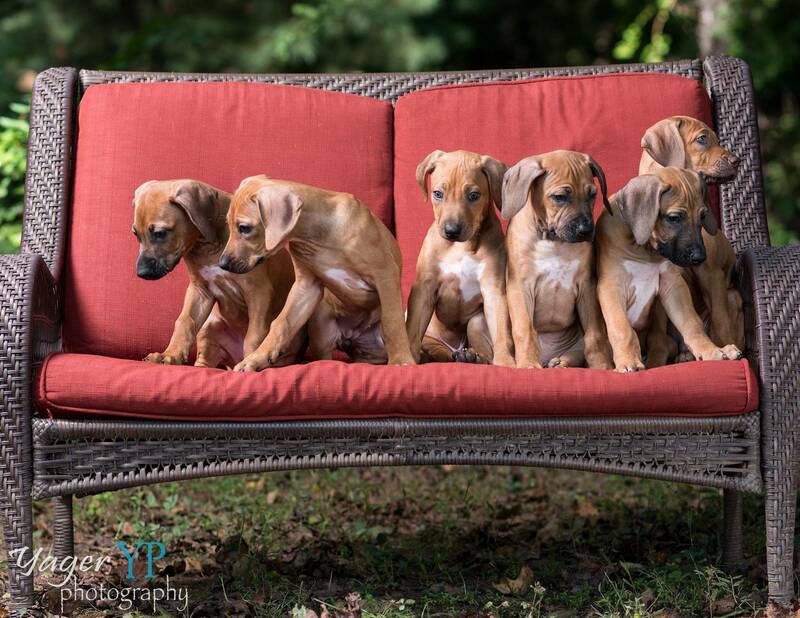 Permission to use any content may only be approved by the owner "Semper Fidelis Rhodesian Ridgebacks" upon written consent.